They're singing a familiar tune over in Columbia MO. The Missouri defensive coordinator and his sophomore linebacker understand that stopping Gurley isn't an option, but slowing him down just might be enough. 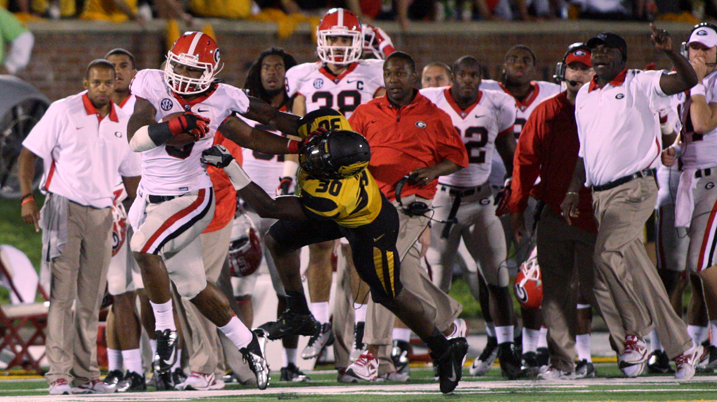 Anything less than 150 yards for Gurley might be considered a victory of sorts for Steckel’s defense. In Georgia’s lone loss, South Carolina limited Gurley to 131 yards on 20 carries. And it's the fourth quarter that will separate the men from the boys. Scherer watched enough film of Gurley during Mizzou’s bye week to recognize one of the most remarkable parts of his game: Gurley has averaged 10.6 yards a carry in the fourth quarter, the best average by any player with at least 15 fourth-quarter carries. Four of Gurley’s nine runs of 20 yards or more have come in the fourth quarter.